Kuala Lumpur: Top Indian shuttlers PV Sindhu and Kidambi Srikanth advanced to the second round but Saina Nehwal failed to cross the opening hurdle at the Malaysia Open World Tour Super 750 tournament on Wednesday. Olympic and world championship silver medallist Sindhu staved off a spirited challenge from World No 20 Aya Ohori 22-20 21-12 to record her sixth win over the Japanese, while India Open finalist Srikanth beat Indonesia's Ihsan Maulana Mustofa 21-18 21-16 in 38 minutes. Fifth seed Sindhu will now look to avenge her All England loss against Korea's Sung Ji-Hyun, whom she faces next, while Srikanth will meet Thailand's Khosit Phetpradab on Thursday. Eighth seed Saina, who came into the tournament after recovering from a pancreatic infection, fought hard before going down 22-20 15-21 10-21 to Thailand's Pornpawee Chochuwong. HS Prannoy, who had reached the quarter-finals last week at New Delhi, however, bowed out after losing 12-21 21-16 21-14 to Sitthikom Thammasin of Thailand following a hard-fought battle. With Sameer Verma too crashing out in the opening round, Srikanth is the only Indian in the fray in men's singles. 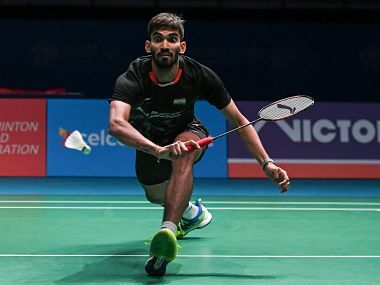 Men's doubles pair of Manu Attri and B Sumeeth Reddy, who had entered the semi-finals in India Open, also failed to cross the opening hurdle, going down 16-21 6-21 to seventh seeds Han Chengkai and Zhou Haodong of China. In the women's singles match, World No 6 Sindhu fell back in the opening game after an initial 5-2 lead as Ohori jumped to a 12-7 advantage. The Indian then clawed back, grabbing a slender 13-12 lead but the Japanese once again moved ahead to hold a game point. Sindhu then reeled off three points to secure the opening game. In the second game, Sindhu changed her strategy and reduced her errors to zoom to a 12-5 lead and continued to surge ahead even as Ohori crumbled.